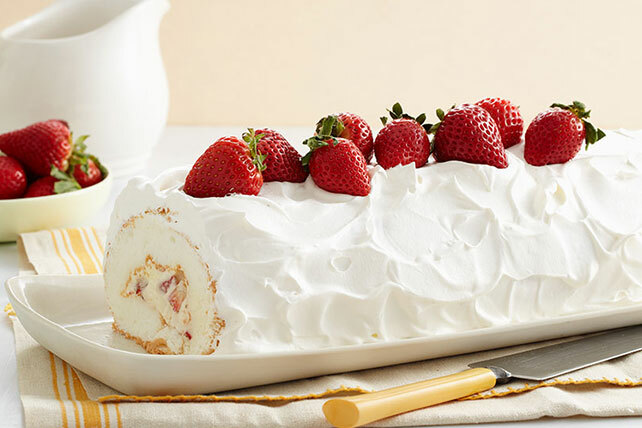 Make this Heavenly Strawberry Jelly Roll for a sweet treat at your next gathering. This jelly roll will also double as a centerpiece for a special occasion. Line 15x10x1-inch pan with parchment paper; spray with cooking spray. Prepare cake batter as directed on package; pour into prepared pan. Spread batter to cover bottom of pan. (Pan will be full.) Bake 20 to 22 min. or until top is golden brown and cake springs back when touched lightly in center. Cool in pan 30 min. Sift sugar over clean kitchen towel. Invert cake immediately onto towel; remove pan. Carefully peel off parchment. Starting at one long side, roll up cake and towel together. Cool completely. Reserve 1 cup berries; coarsely chop remaining berries. Beat pudding mix and milk in medium bowl with whisk 2 min. Refrigerate 5 min. Stir in 1 cup COOL WHIP and chopped berries. Unroll cake; remove towel. Spread berry mixture over cake, leaving 1-inch border around all sides. Reroll cake; wrap in plastic wrap. Refrigerate 1 hour. Unwrap just before serving; place, seam-side down, on platter. Frost with remaining COOL WHIP. Top with reserved berries. For best result, use a serrated knife to slice the dessert. This will help prevent the cake roll from tearing or being crushed as it is sliced.